Highlights from Monday's concert on the green are now on our new YouTube channel. Subscribe to our channel and follow us on Google+. Eric Bable has recently been named the conductor of the Canfield Community Concert Band. 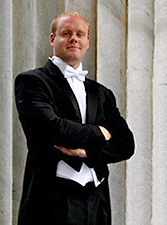 He holds a Master of Music Degree in Conducting/Euphonium Performance from Youngstown State University and a Bachelor’s Degree in Music Education from Slippery Rock University in Pennsylvania. Mr. Bable looks forward to continuing the musical tradition of the Canfield Community Band, which was started in 1976. "I'm proud to follow in the footsteps of a talented group of conductors who have led this community band, and I encourage area musicians to come and join us." We will begin our regular Tuesday rehearsals on October 22 in the high school band room. We'll post a detailed schedule as soon as it's available, but we will continue weekly rehearsals starting on the 22nd. The rehearsal schedule for the remainder of July is going to be slightly different than originally planned. Due to the summer maintenance schedule at the high school, we are unable to use the band room. Thanks to Becky and Carl Schaub for securing some space at the Canfield Methodist Church for the three remaining July rehearsals. The church is located on 46 in the center of town near the gazebo where we perform. Parking is available in the lot between the church and Dairy Queen. Use the portico entrance and go to the basement. Please bring a music stand! We will have a guest conductor for the August concerts. John Manhollan will be leading us in a program that will include some new selections for the August 5 concert on the Green and the August 10 concert at St. Louis Church. We will be rehearsing with him for the remainder of July. If you have a copy of Brian's old rehearsal schedule, it is no longer accurate. Please make an effort to attend all the rehearsals as we have some work to do to prepare a new program with a new conductor. Please also let Kim know as soon as possible if you are unable to play any of the concerts so there is time to make alternate arrangements if necessary.